Asphalt shingles are one of the least expensive roofing materials, and they are available in a wide variety of colors. Asphalt shingles are commonly used on sloped roofs, single homes, and smaller residential projects just to name a few. This material is very easy to install and provides flexibility during its installation process. Nowadays, shingles are also available with different textures and thickness, and they can be treated against mold and mildew. Asphalt shingles are divided into two categories: organic and fiberglass. Organic shingles are made up of paper with an asphalt coating that converts them into a waterproof product. Fiberglass shingles provide better fire protection than organic shingles. Like organic shingles, fiberglass shingles are treated with a protective resin coating that converts them into waterproof material. New developments and technology have led to the creation of architectural shingles, using two layers bonded with a special sealant that adds an appealing visual effect to the roof. How Much Does a Shingle Cost? In general, shingles are not expensive and can be acquired and install very easily. A bundle of shingles will cost about $30 plus tax, which comes out to about $90 per square. The price of the shingle will vary depending on the type of single being used. The square is an industry term, and it is defined as 100 square feet. Cedar shingles can cost as much as $300 per square, so be aware when estimating that not all costs are the same. Asphalt shingles can be a great alternative for a quick and economic repair, but be sure to understand the benefits and drawbacks of using this product. Starter Shingles: It is really important to have the starter course installed right. Without this, the wind might affect the whole roofing material, by slowly generating uplift pressure that will affect and tear apart the shingles. It is critical for a good shingle installation. Use the Right Nails: When nailing down shingles, make sure you are installing the nail at the right location, right angle, and spacing. It is important to use the right nail, including the length and material of the nail. Be sure to apply the necessary amount of force when installing shingles to prevent shingles from being removed by wind and time. Valleys, Hips, and Ridges: When a shingle roof leaks, is normally due to an improper valley, hips, or ridges. So make sure to install the valleys at the right location, with the planning required to reduce leaking problems. At the same time, make sure that the flashing method is the right one for the installation in these critical areas. Attic Ventilation: Almost every building code requires proper attic ventilation, so be sure you are aware of your local building code requirements. PPE: Last but not least, when installing roofing make sure all crew members are wearing the right PPE and all safety precautions have been taken. 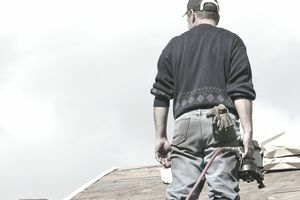 For asphalt shingles, National Roofing Contractors Association recommends: "a single layer of No. 15 asphalt-saturated underlayment be used with roofs having slopes of 4:12 (18 degrees) or greater. For roof slopes between 3:12 (14 degrees) to 4:12 (18 degrees), NRCA recommends a minimum of two layers of No. 15 underlayment. If you are installing a heavier-weight shingle with a projected long service life, using No. 30 underlayment instead of No. 15 would be appropriate."